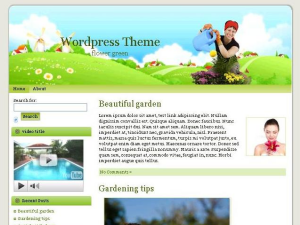 Home Garden wordpress template is a beautiful – somewhat artistic WP design. The theme is well suited for a nature lover or gardner blog. The header graphic of this wordpress design features a girl watering her plants, while there are some green hills and wind mills visible in the background. 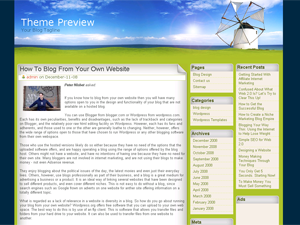 This is a two column wordpress theme with the sidebar possitioned on the left side. 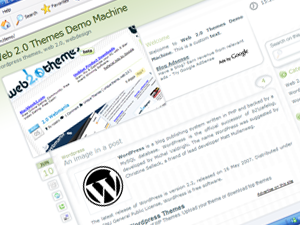 It is wordpress widgets compliant and can be modified as per the owner’s wish. The main content area (as well as the sidebar) is white with black text. Home Garden wordpress theme was designed by Digitaldiscountcodes. Fresh Fruit wordpress theme is a cool green wp design which features a header image with various types of fresh fruit. 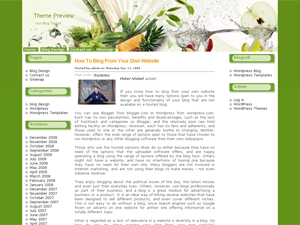 The two prevailing colours used in this wordpress skin are green (background) and white (main content area and the sidebars. There are two sidebars – one on either side of the main content area. The left sidebar is wordpress widgets compliant (you can define the menus in your blog’s admin area – under Appearance / Widgets tab). The right sidebar contains the blogroll and Meta (which is renamed to Admin in this theme). Fresh Fruit wordpress template was submitted by an anonymous and there was no author name given in the style.css. This theme is perfect for a health related blog or a diet, weight loss, fitness web site, etc..
Green Jack wordpress theme is a beautiful and elegant green WP design. The look is minimalist with no bloated and unnecessary graphics. There is just a picture of a green apple in the upper righ corner and that’s about the only image in the entire wp skin. The pages links are located in the header (just above the apple). Overall this is a two column wordpress template with the main content area possitioned on the left and sidebar on the right. The sidebar supports wordpress widgets. 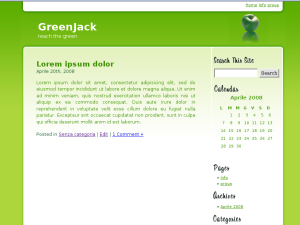 Green Jack wordpress theme was designed by Jackass. 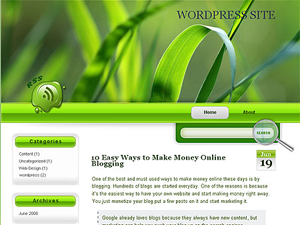 Green Candy wordpress theme is a simple and beautiful natural design. 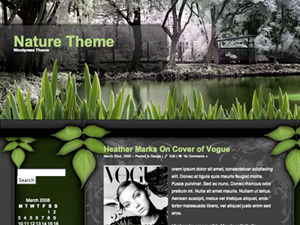 The WP skin is mostly green with a loveley header showing some green grass leaves. On the bottom left of the header there is a RSS feed icon, followed by pages menu. Main content area and the sidebar are white (with green headers). The sidebar is located on the left side and is wordpress widgets ready. The search function is just below the header, on the right side. The search button is a magnifying glass icon. Green Candy wordpress template was designed by Lorelei. Note: Enable wordpress widgets in your blog’s admin area. Log in and see “Appearance” tab on the left sidebar. 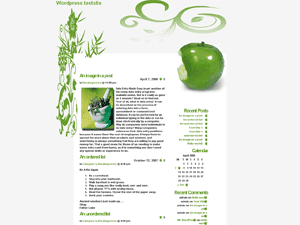 Green Apple wordpress theme is a simple white, 2 column wp design made by Big Muzzy. Theme is mostly white with an exception of green header graphic and a big green apple in the top right corner just above the sidebar. This wp theme supports wordpress widgets – you just have to enable the widgets function in your blog’s admin area (under Appearance you will find the Widgets tab). This wp design would be perfect for a health, diet or fitness blog. Diet is a clean and simple two column wordpress template. The background is light green, main content area is white with black text. This is a “widgitized” wp theme which requires you to enable wordpress widgets before the sidebar menu comes up. The theme features a beautiful girl in dressed in gym outfit, next to her there is a word “Diet” spelled out in fruit. 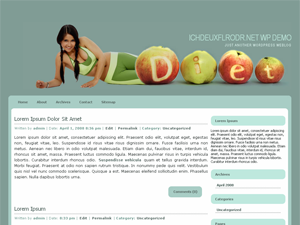 Diet wordpress theme was designed by Rozeh. Login to your blog’s admin area, click on Appearance then click on Widgets, then select Sidebar from the pulldown menu which is located in the top right corner. Next add available Widgets. Make sure you click “Save Changes” when you are done. Voila, your widgets should show up on your blog. Mill is a beautiful wordpress template designed by web2feel.com. 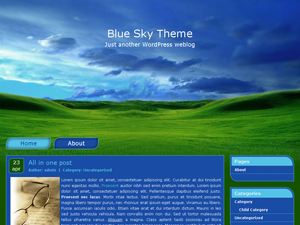 It’s a 3 column wp theme in mixed color combination of green and blue. Theme’s background is dark blue (navy) and the header graphic features green grass, wind mill on the sea shore and beautiful blue skies with scattered clouds. Both wordpress sidebars are on the right side. The middle one contains pages, categories, archives meta and blogroll while the outermost contains recent posts and ads.